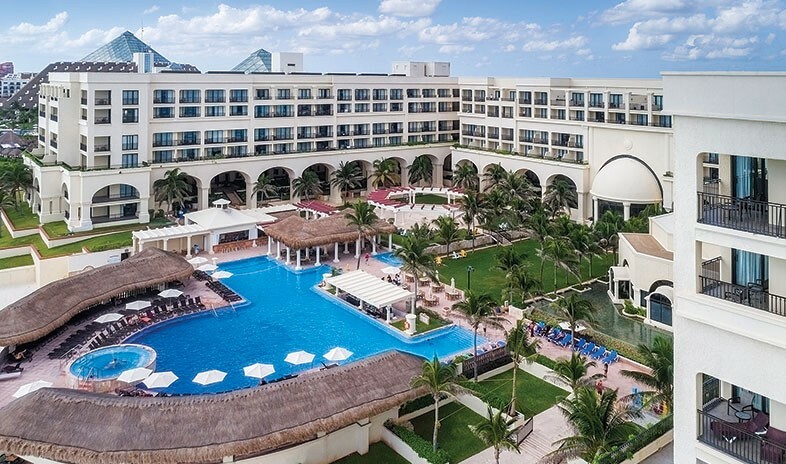 Set in the heart of the Hotel Zone, the Marriott Cancun Resort offers an ideal location for relaxing in the Mexican sun and exploring all the nearby attractions. The impressive six-story hotel houses 450 guest rooms, including 38 suites — all with private balconies overlooking the Caribbean Sea and Nichupté Lagoon. Five restaurants offer tastes for every palate, from fresh Caribbean seafood and Argentine-style steaks to Thai and Japanese menus and universal comfort food at a lively sports bar. Nearby golf and an on-site beach, ocean sports, fitness center, mammoth pool, and full-service spa fill a large portion of most guests’ leisure hours. But the options also include nearby Mayan ruins and the nature parks Xel-Há and Xcaret. Back on-site, memorable meetings regularly take place as a matter of course. The property’s dozen conference rooms accommodate up to 800 delegates, while outdoor venues host up to 700. As if these grand facilities and location weren’t enough, a footbridge leads directly to the JW Marriott Cancun Resort & Spa next door. Together, the sister properties provide more than 80,000 square feet of meeting space and share a private group check-in area, cross-trained conference and event staff, and a single reservations and billing team. Marriott Rewards and optional all-inclusive meeting packages sweeten the deal with a plethora of perks and savings for meeting planners, delegates, and stakeholders alike. and multiple bars and lounges.